For any bug report or feedback, please send an email to jegx[AT]ozone3d[DOT]net and add "[DEMO FEEDBACK]" to the subject. 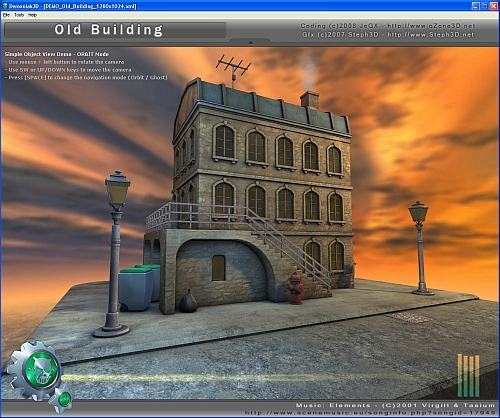 Vous can also post your feedbacks in the demo's topic: Demoniak3D Demo - Old Building. 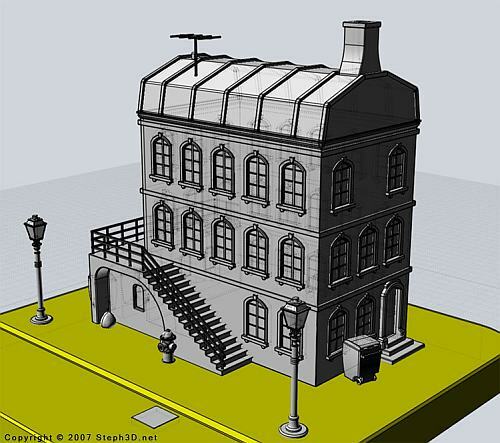 Here is a quick making-of the Old Building demo. 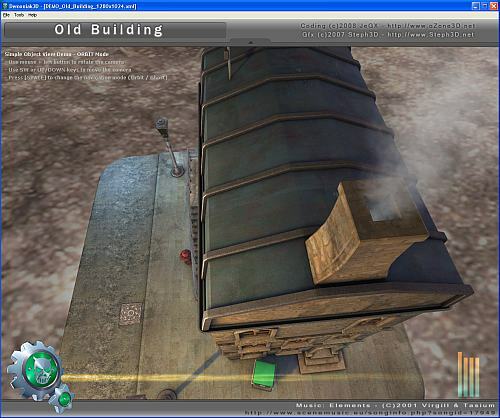 The start point is the modelization of the building. 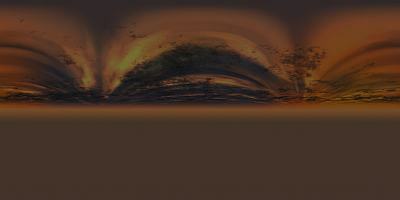 The modelization has been made with Moment of Inspiration (MoI) and finalized in Cinema4D by Steph3D. Once the modelization finished, one has to extract (and this word is weak!) the master-piece from C4D. 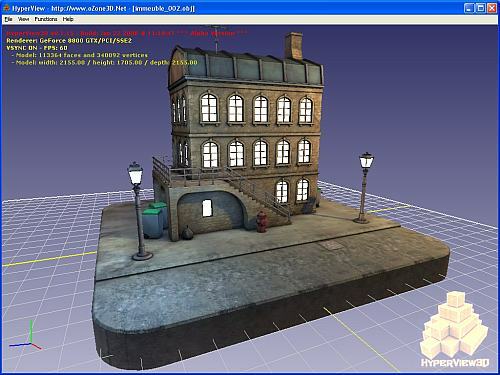 To get that aim, we have used the Riptide plugin for C4D, that allows to export the model in OBJ. 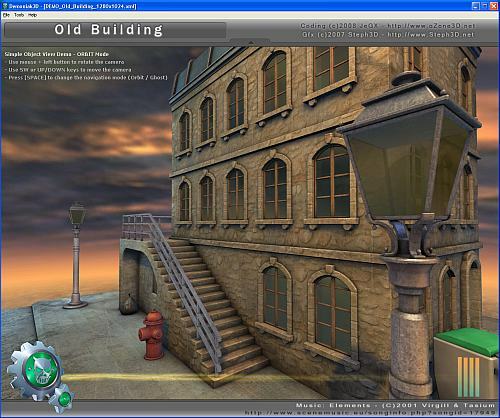 The o3mff format stores the object's geometry as well as the textures. 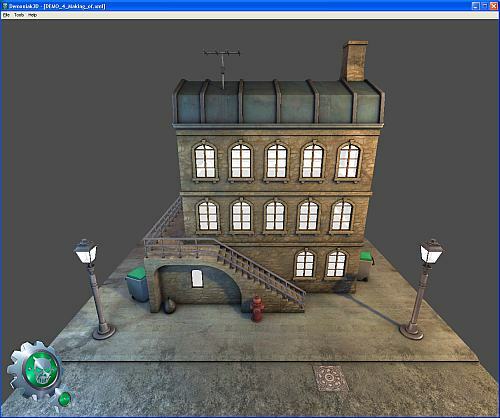 For this demo, the textures have been baked in Cinema4D. 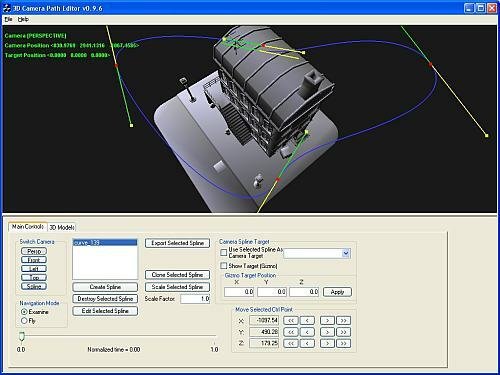 That makes it possible to have a realistic rendering (that takes into account shadows and global illumination) at no cost since any calculation is done during the frame rendering. 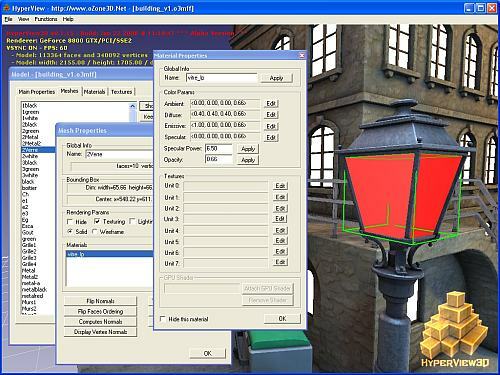 We take advantage of Hyperview3D to get the materials's name of building's transparent surfaces (street lamp, windows). This is important because the demo needs to access to these materials to add reflection effects. 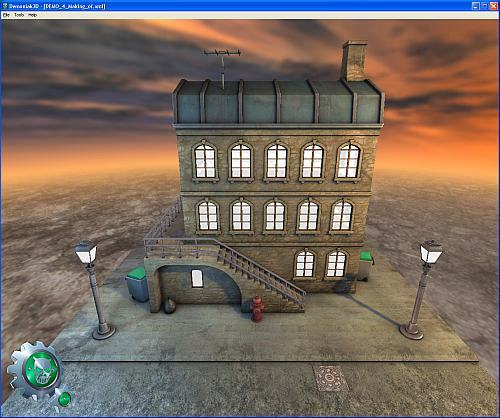 Now that we have done the preparation work, we can start Demoniak3D demo coding. 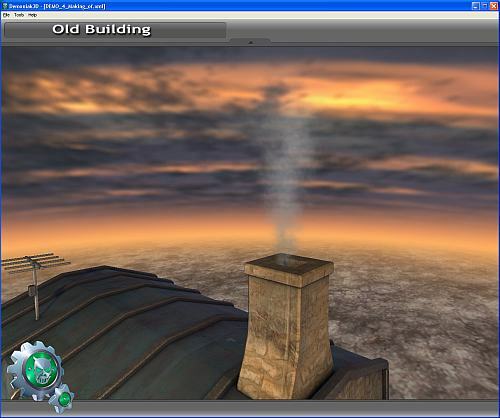 The skybox loading code is localized in the <skybox> xml element. 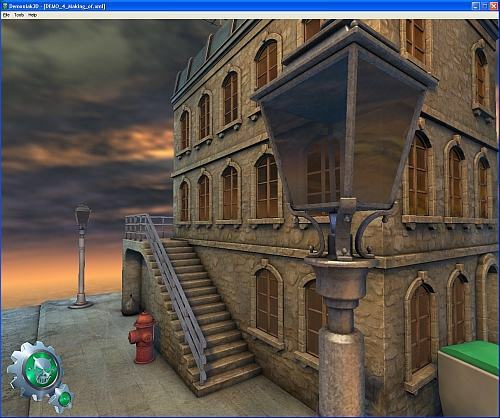 In order to add more realism to the building's windows and street lamps (which appear white in the previous images), we're going to apply a simple sphere mapping GLSL shader. 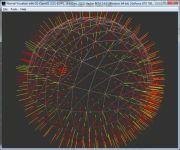 For mode detail on the sphere mapping technique, see: Spherical Environment Mapping. 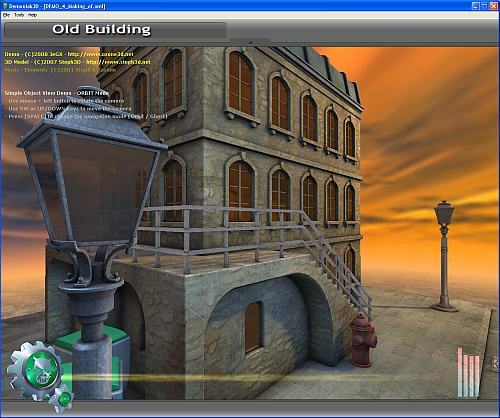 The demo has an automatic mode: after five seconds of mouse non-activity, the camera switches to the automatic mode and the camera's trajectory follows the motion-path. This motion-path has been done with CameraPathEditor. The four-band equalizer allows to see background music's variations by reading the audio buffer. the equalizer is created dynamically in LUA (see the function BuildEqualizer()). Then the audio buffer reading (HYP_Sound.GetSpectrumValue()) allows us to move vertices of each band. Here we are, this small making-of is over. Many details aren't covered on purpose because of the lack of time. 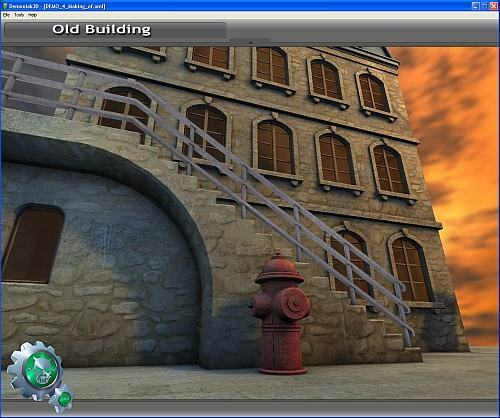 But I'll anvser with pleasure to all your questions in the demo's thread: Old Building @ Demoniak3D Forum. For stuff related to Cinema4D modelization, please post here (only french messages are accepted): Vieil Immeuble @ Steph3D Forum. Page generated in 0.0032570362091064 seconds.